Berlin, NJ. Editor: Jeremiah Hacker. 17/1, July 1867-1868(?). 8 pp., $2.50 a year. The journal continued the volume number of Pleasure Boat/Portland Pleasure Boat. This was the last attempt by Hacker (1801-1895) to publish a journal to proclaim his ideas. He was a poet, freethinker, universal reformer, sometime spiritualist, and Quaker,who, after the demise of Chariot of Wisdom and Love, removed from Maine to Vineland, the huge colony of “friends of progress” and spiritualists founded in southern New Jersey during the Civil War. As with its immediate predecessor, the journal carried a strong defense of spiritualism against charges of demonism and free love (exemplified by Thomas Lake Harris), but was mainly devoted to Hacker’s reform peeves and rants. 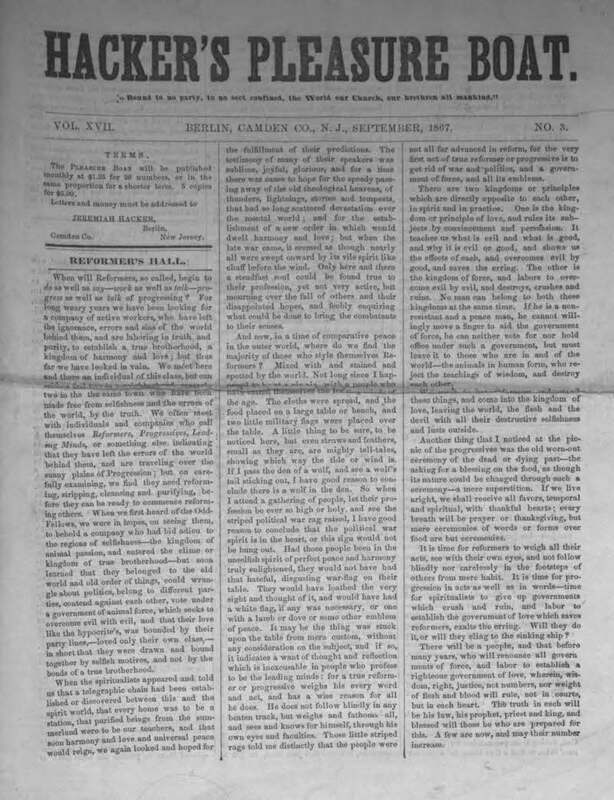 In March 1868, Hacker announced that he would begin to publish the journal on a quarterly basis until his subscriptions increased. Hamilton College; Rutgers University; American Antiquarian Society.